Welcome to DAY 2 of the Quick Quotes Get To Know The DT Blog Hop! I am thrilled to be a part of this wonderful company’s design team. If you are following the hop, you should have arrived here from Lisa’s Blog. If you just happened upon here, be sure to head over to the main Quick Quotes Blog and join the FUN! Our blog hop started yesterday and goes through Saturday. So please be sure to visit each DT Member’s Blog. We all have some GREAT QQ candy to giveaway! You can visit my post from yesterday HERE to see my other QQ project. 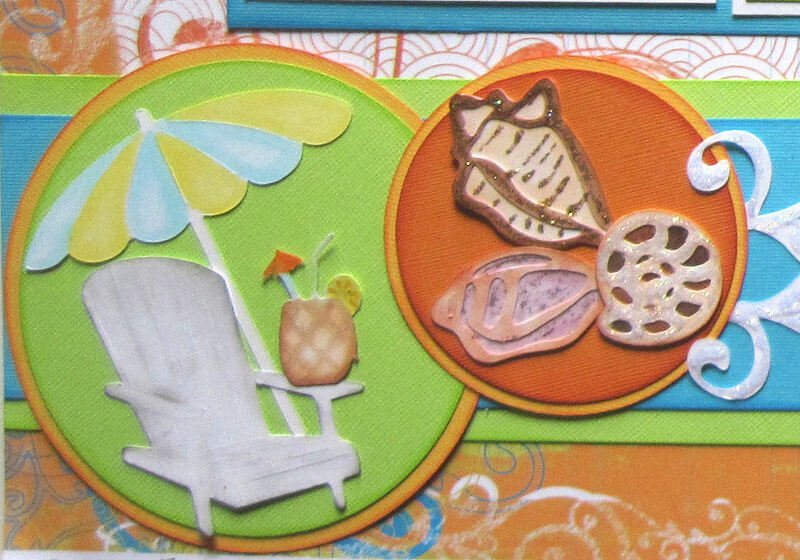 I created this layout using Quick Quotes June Club Q Kit. The kit features the super fun Designer Paper Live Out Loud. 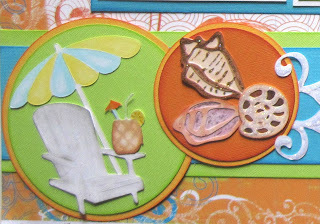 I used QQ’s Powder Puff Chalk Inks In:Limeade, Mango Mai Tai, Blue Hawaiian and Maraschino Cherry. I also used Aqua, Lime Green, White, Light Orange and Dark Orange Bazzill Cardstock. I also used several Cricut cartridges. This layout is featured in The Bug Magazine. For details be sure to head to The Bug Magazine and pick up your issue today! Be sure to drop by tomorrow for day 3 of the hop and I bring you another great Quick Quote project! I love the layouts. This was the 1st paper that I got from Quick Quotes. Looking forward to using it more. This is sooo my kind of lo -- thanks for sharing! I love your Sunny Day Layout, thank you for sharing. Awesome Cricut ideas. I love my Cricut and with the Gypsy it brings it to a new level. Thanks for sharing! So very pretty! Thanks so much! very beautiful layout, congrats on being featured in The Bug Magazine, thanbks for sharing, I am a follower. Love the colors of the layout and the inking on the chair. The summer page layouts are great! I really like the French Quarter paper. I have become a follower on your blog. Thanks for sharing. Love your layouts,thanks for sharing. Beautiful! I love that you have used totally different pallets in your two projects but both are equally pretty. LOVE LOVE LOVE IT!! I really like the colors. You did a fantastic job. This is a cute layout! Wow your lo is amazing!!!!! I love the layouts, but especially appreciate all of the cricut ideas. I'm always looking for new ways to use my cricut! I love your fun summer layouts. Love the layouts. Someday mine will be as cool. Love your site. I just want to go to the beach after seeing your layouts. I love, love, love the powder puff inks!